We’re down to the last week of Steve’s goal of gathering 5K for Louisville Free Public Library. Which means, we’re down to the last week of the enter to win really awesome wool and/or me knitting it into something for you! Here’s the kick off post . 1) Donate to LFPL either by mailing them a check or contributing via Paypal to the Library Society of the World fund. He’s already sent one check when we hit the half way point and it has been received. 2) Email me/Facebook me/Direct Message me on Twitter or Friendfeed or Plurk and let me know either a) you donated (for one chance) or b) how much you donated for one chance per $5 donated. My email is on the blog homepage if anyone needs it. I’ll be doing the drawing on September 2, 2009, results to be posted shortly thereafter. 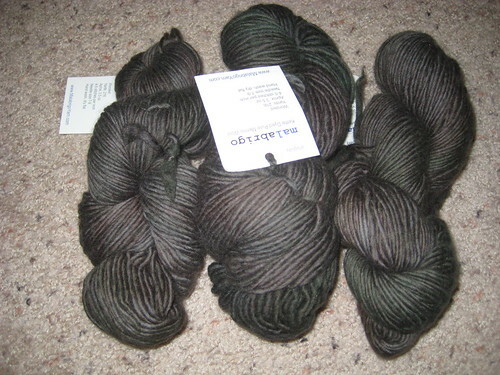 Come on…it’s Malabrigo. And it’s going to a good cause!! Help Steve Lawson and the LSW make the five thousand dollar goal! !